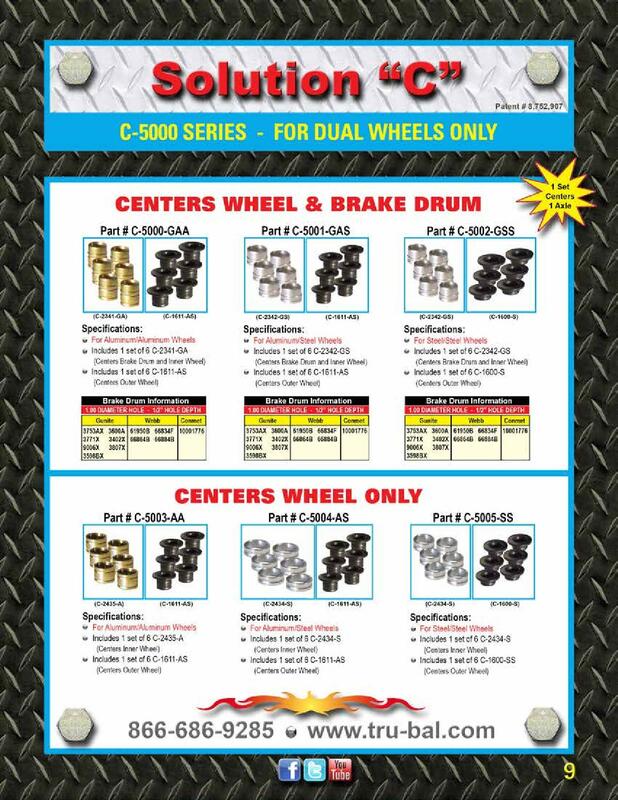 Tim wrote: "On top of having new drive tires and wheels installed yesterday, I also had Tru Balance Wheel Centering devices installed on the steers. 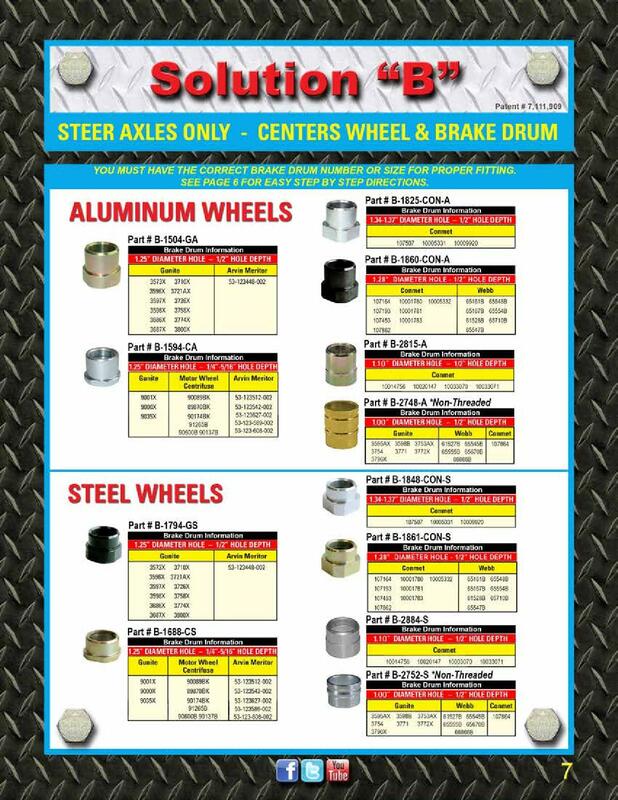 The Soultion B devices work to center both the wheel and brake drum. The truck feels like a brand new one, it rolls smooth as silk now. 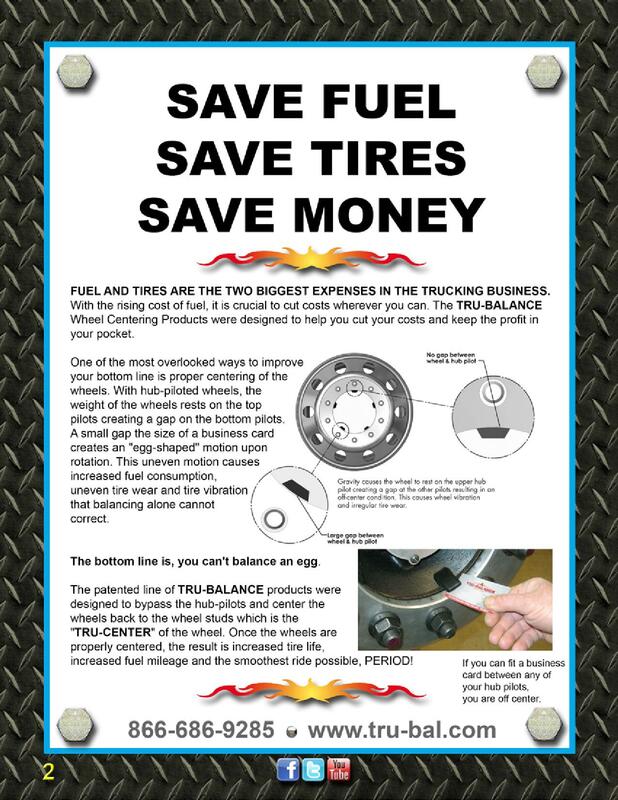 T&E Tire in Kansas City gave me an excellent price on the Tru Balance kit installed, almost half of what I had been quoted earlier. I highly recommend both the product and T&E Tire to all my trucker friends. Thanks Kevin Rutherford for excellent advice." 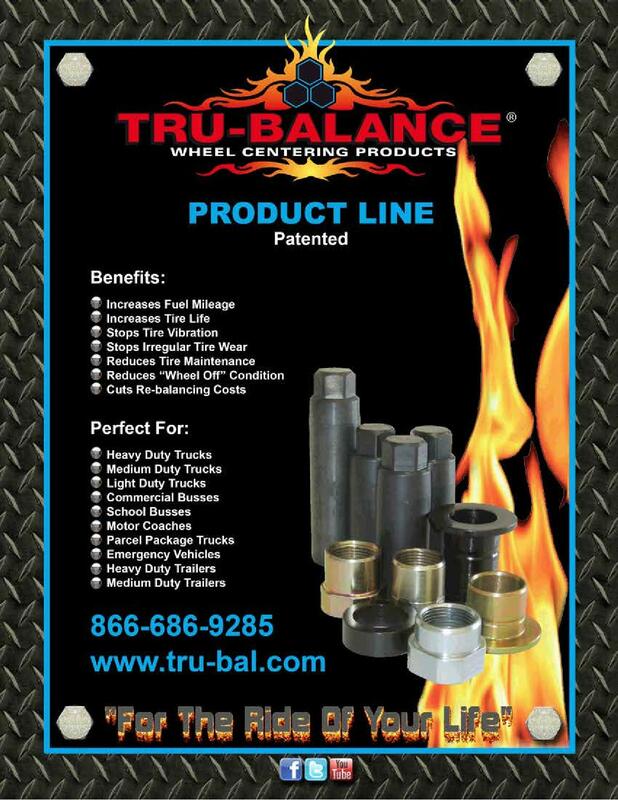 Hi Bob, I am Angela Lang the vice president and one of the owners of TRU-BALANCE Wheel Centering Products. I read your review of our products and am very sorry to hear that the products didn't work for you. We rarely run into an unsatisfied customer so we would really like more information from you as to what your experience was and with which of our products. We would really like the opportunity to work with you to figure out why the products didn't work for you like they work for so many others. I have looked through our entire data base which goes back 7 years for your name and/or company name so that we could contact you and fix this situation. I can't find you anywhere in our system. You may have purchased the product from one of our dealers. Even if this is the case, we would still love to speak with you and make the situation right for you. Since I don't have any of your contact information, please contact us here so we can help you out. Thanks! 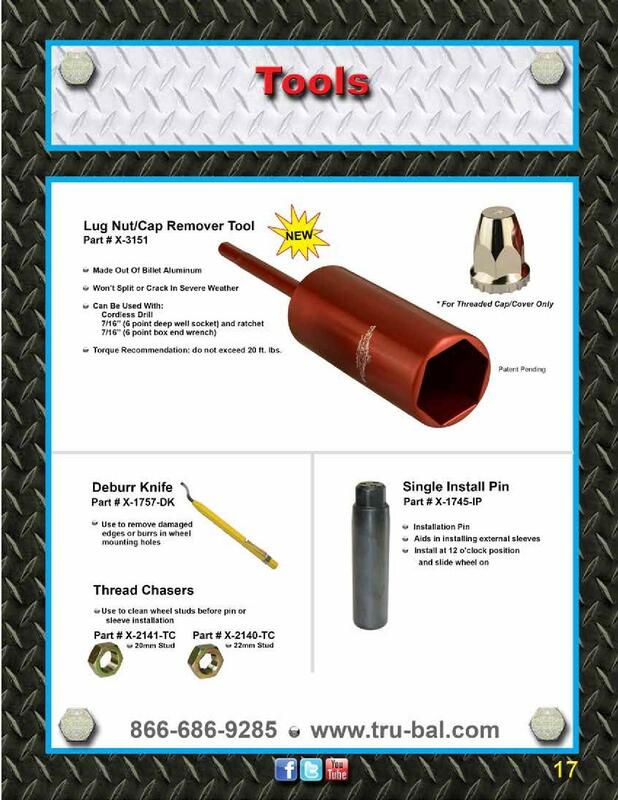 After about one year of spending money on everything I and the mechanics could think of trying to solve my vibration problems this product is what took care of it. After trying many different products for vibration, this one is by far the best out there, best money ever spent on anything related to my truck. Thank you so much for making such an excellent product. WE HAVE A 2003 INTERNATIONAL TRUCK THAT HAS BEEN HOPPING EVER SINCE WE BOUGHT IT. WE HAD BEEN TO INTERNATIONAL MANY TIMES (COSTING US A LOT OF MONEY) WITH THIS PROBLEM- THEY HAD NO SOLUTION. AFTER MANY YEARS OF FIGHTING THIS PROBLEM WE CAME ACROSS YOUR WEBSITE AND FOUND THE ANSWER TO OUR PRAYERS. 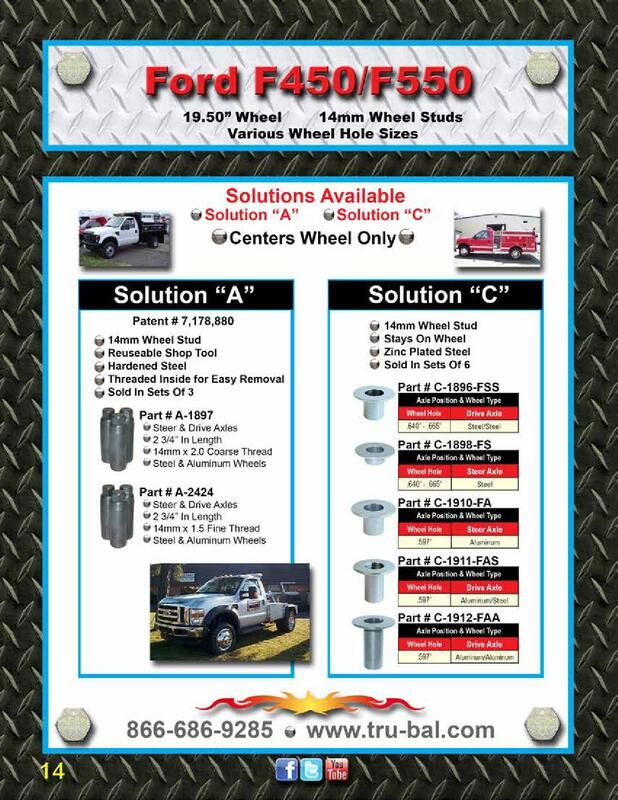 THIS IS A GREAT PRODUCT YOU MUST HAVE IF YOU HAVE TROUBLE WITH YOUR TRUCK "HOPPING DOWN THE ROAD". Howdy Folks, How many thousands of miles have you tried to convince yourself that the hop in your truck was just part of "bein a truck" Ever since I bought my 2001 Freightliner Columbia and Timpte hopper new, I've been trying everything I could think of to smooth out the ride. Over the 6-1/2 years I've owned this truck & trailer I've changed shocks every year, put Centramatics on all axles (trailer also), balanced every tire/wheel (tractor only), certified the air-bag ride height was correct, have done periodic alignments on both tractor & trailer, and assured mhyself I did not have a bent or warped wheel somewhere in the mix. Whew!! Sorry that was so long winded, but that's how frustrated I've felt after doing all that, and still had the hop. (I'm not taking a darn thing away from the Centramatics, I swear by them also, my tire wear proves that.) 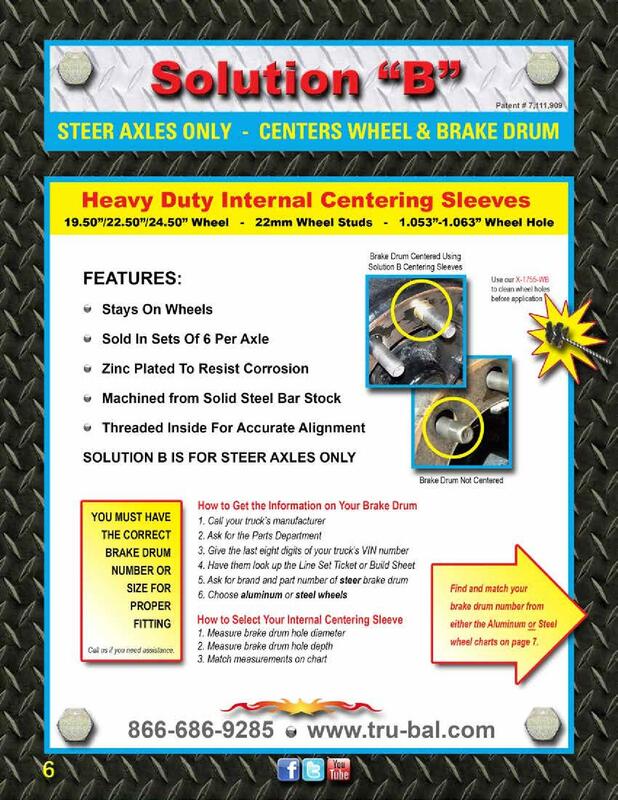 Back to my point: About a year ago, I decided to spend a little more money on my hop-stopping quest, and bought the Tru-Balance centering sleeves for the brake drums on the drive axles. Ron with Tru-balance insisted that I purchase only one set at a time, then more later if I was happy. A little later I had him overnight me some sleeves for my drive axle wheels. Again, I was happy, as a little more of the hop was gone. But I still could feel a hop which I felt was still in the drive axle area. I haul bulk commodities, so I have added a suspension guage on my dash for the trailer tandems. I can watch the air bag pressures on both sets of tandems from my seat. From the beginning, the trailer tandem air guage needle would "float" while going down the road. The driver tandem suspension guage needle would constantly "quiver" & "shake". My gear shift stick would bounce, as well as the sun visors and mirrors. Quite often, when I would apply brake, I could feel some uneven braking thru the steering wheel. Last week, while I was in Pennsylvania, I gave up, called Ron, had him overnight me the centering sleeves for my steer axle to the TA in Breezewood, Pa. He advised me the freight would be fairly expensive, and I said I didn't care. The TA shop put them on for me, and the result I experienced was unbelievable! My driver suspension guage needle ceased shaking, my sun visors don't shake any more, and I can see everything in my morrors without having to put up with the shaky vision, even on the PA Turnpike! I was so reluctant to spending the money to put the sleeves on the steer axle wheels because I was convinced the bouncing was coming from somewhere in the rear part of the tractor. The braking has smothed out also. 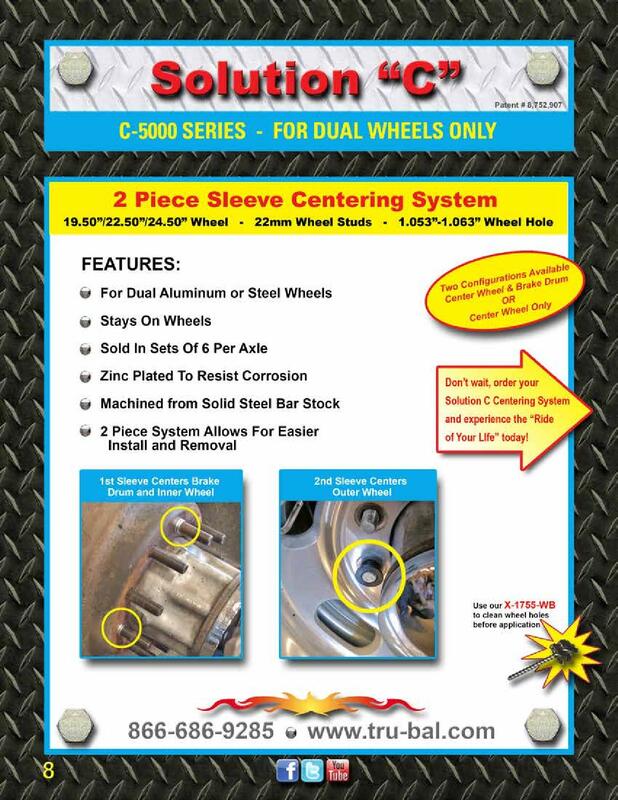 I'm not so sure but that I may purchase sleeves for my trailer wheels also. I highly advise anyone who owns a truck (and trailer) to feel the money spent on this invention would definitely not be a waste. Of course, a tight maintenance schedule of doing all the other things mentioned above is crucial to keeping a truck performing at its optimum. With fuel being our single most expensive cost of operation, and tires being the second, it behooves us to do everything we can to enhance our equipment's performance. 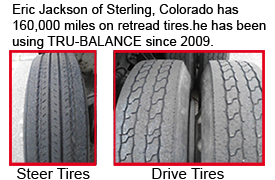 When the truck is running staight down the road, and the tires/wheels are in total contact with the road surface, we can't help but experience better fuel mileage, better tire wear, and overall extended equipment life. Not to mention less driver fatigue through a smother ride, and not having to fight the steering wheel to hold the truck on the road. In compromising driving situations, a properly maintained vehicle is easier to control. 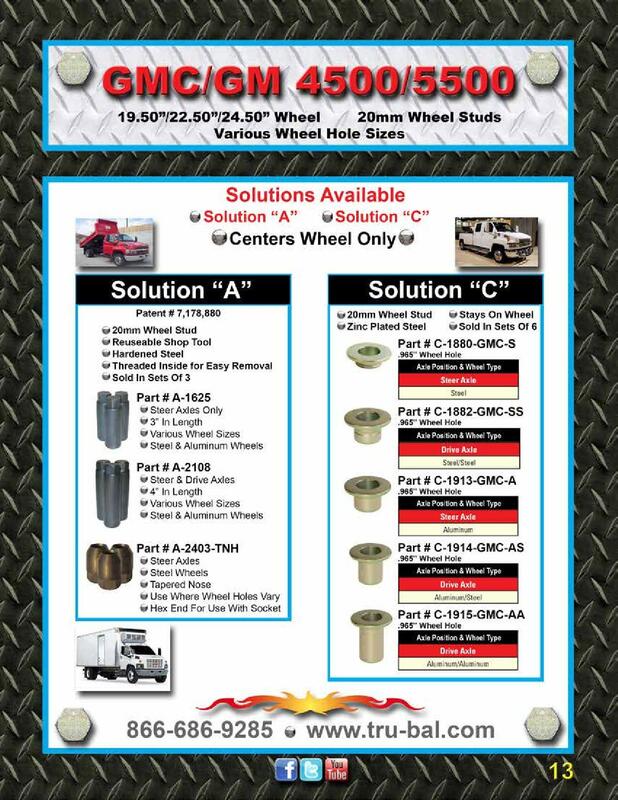 I thought when the truck manufacturers came out with the hub-piloted wheels that there couldn't be any thing else done to keep the wheel attatched to the hub/axle more securely, but Tru Balance has shown me I was wrong. 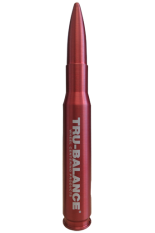 DON'T HESITATE TO INVEST IN TRU-BALANCE. It'll make a believer out of you, too. Thank You Tru-Balance. 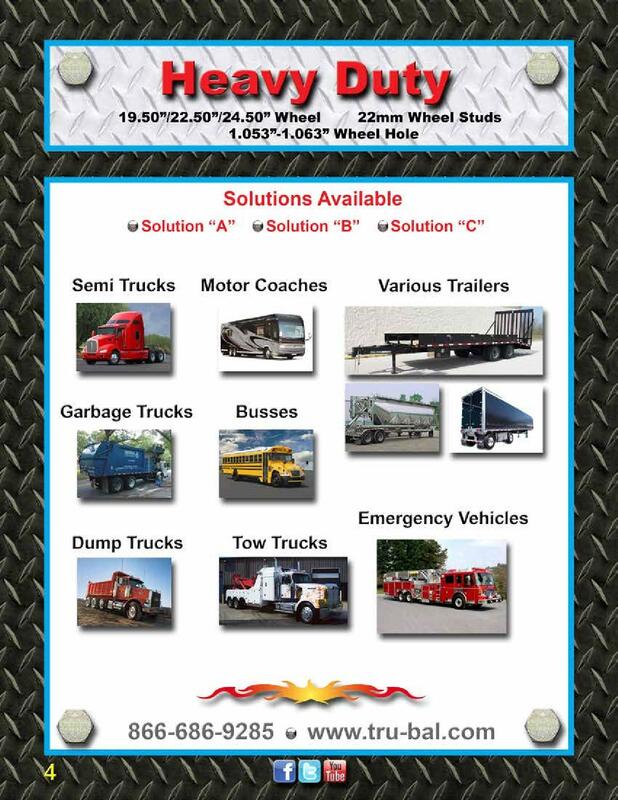 Sincerely, Curt Helmle Helmle Trucking, Inc. I have tru-bal on a 1997 ih 9800 cab over set back axel.I would only get 70,ooo mi on a set of steers until I put these on 2yrs ago. Now Iam getting 99,000+ on a set. i recently had totally rebuilt the front end on my 9400 international and put new steer tires on. after high speed balancing the front end had an annoying shake.i read an ad in the truckers news about tru-balance and decided to give them a try.after getting the info and ordering solution b iam happy to say that after @10,000 miles after install they work exactly as described and there is no shake or vibration in the steering wheel. the truck even goes straighter down the road no pulling a little to the right as before. 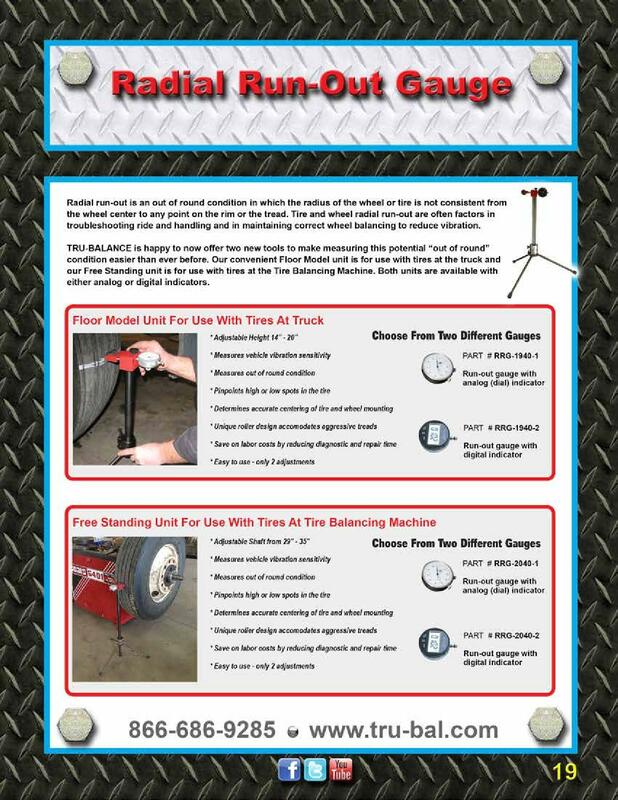 best thing i ever did and will be putting tru balance on drive and trailer axles as well. get product that really works!!!! Now it rides like a Peterbilt should. I bought this 2001 Peterbilt 387 in 2005. There was a bad vibration in the front end. I had a three axle allignment. I had new tires balanced and installed. Nothing helped. The mechanics said I probably needed new hubs to center the wheel properly. These centering devices saved me quite a bit of time and money. I will never run a truck without them again. This is a product we really needed. We have a 2006 40' Allegro Bus. We returned from a trip to Alaska this summer with around 32,000 miles on the motor home. The front tires were extremely warn. A tire shop in Las Vegas, NV said the tire wear was called "river wear" in that it was uneven wear. Along with this wear I had what felt like a bad shimmy in the front end. I had the motor home serviced at about 24,000 miles at Freightliner in Missoula, MT. I asked them to check the front end because I felt a slight shimmy. They said the front end was OK. The shimmy continued and got worse during the trip. When we returned I replaced the front two tires and had them balanced. I then took the motor home to Freightliner in Las Vegas and had the motor home aligned. Driving home I still felt a very slight shimmy. 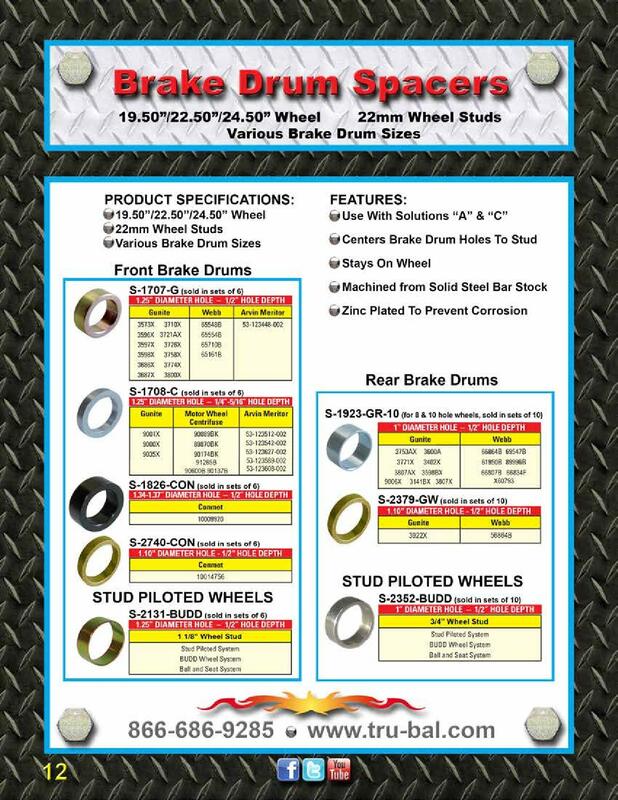 I called the Freightliner 800 number and they told me I needed to have a "radial run out" on the front two tires to make sure the front tires were centered on the hubs. A friend of mine gave me your web-site and I called and talked to you. I then purchased the External Centering Sleeves. When a friend and I removed the front tires it was obvious that they were not centered. We put the centering sleeves on and remounted the tires. A week after that my wife and I made a trip from Southern Nevada to Colorado Springs, CO and on to central Kansas and return. The centering sleeves eliminated my shimmy and I am extremely satisfied with your product. Sincerely, Ted Smith, Lodandale, NV. OK...I have spent a Year & One Half trying to get the front shimmy out of a coach and was told by chassis, builder fault. Told by builder, chassis fault. Builder even supplied all NEW tires and had to balance 2 front to within 4 oz.. I spoke with Tru Balance...they were aware of this front end shake and sent the sleeves to have installed. Did it today! One month after having front end ALL checked and balanced and one tire was already out of center. The installer had to wiggle to get back to center. SO...You DO get off center without these things! I looked at these sleeves to be installed and wondered...."have I bought a pig-in-the-poke" NO!! Coach does ride SOOOOOOO much better!! Thanks for the help and problem solved! I have had problems with sporadic tire wear since the day I bought my new truck. I own a 2004 Freightliner Columbia. I have had this truck aligned and re-aligned, nothing would fix the problem. Every tire shop told me I had bad shocks, drive too fast, turn too sharp, hauled light loads...you name the reason, I heard it. After new shocks, driving slower, turning wider, nothing corrected the problem. Then one day I went into a Pomps tire to get new steers. They put these tube things on my lugs before installing the tires. I asked them what those were for (with a puzzled look on my face), and they told me it was a centering tool to make my tires run true. A LIGHT WENT OFF IN MY HEAD!!! I was so excited. It all made sense. Now I have more than the normal amount of miles I put on all other tires, and the tires look "NEW". 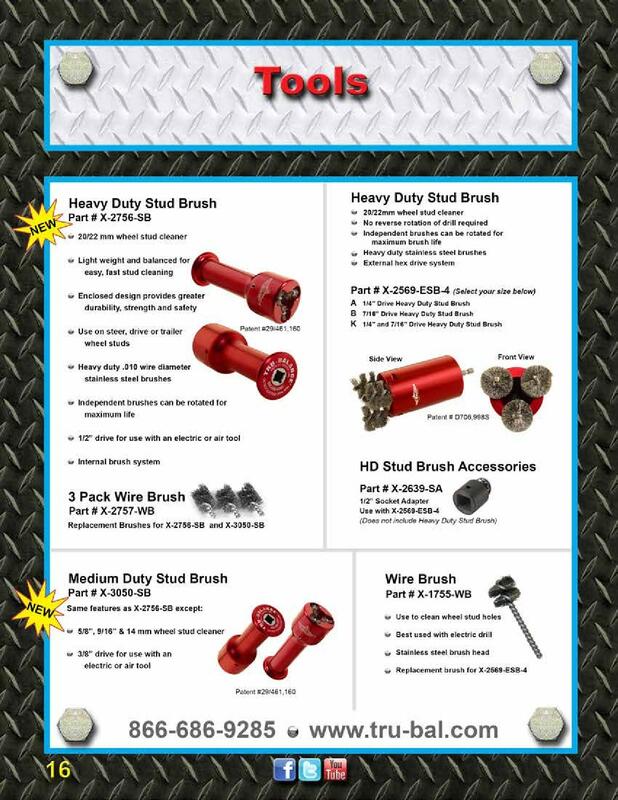 I was so happy with the product, I purchased the tool set to keep in my truck. I do not want my tires ever taken off and me not having the proper tools to put them back like they are now. I tell everyone I know about this tool. Thank you SOOOO much Tru-Balance...You have saved me THOUSANDS!!! these centering products are one of the best things i have purchased this year. I have put a complete set on my 2005 volvo. the smoothness in the ride is night and day difference. i had a wheel pull to the right even after a perfect alignment, after installing the internal sleeves the pull is gone and no more wheel hop. 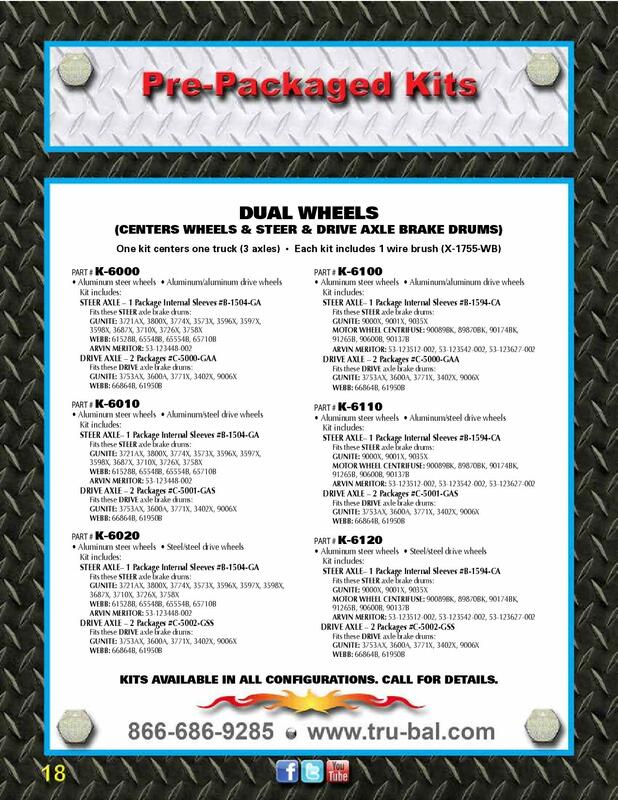 i will be interested to see the increase in tire life because of your products. Installed and noticed the difference right away. Made me a believer. Great product!! 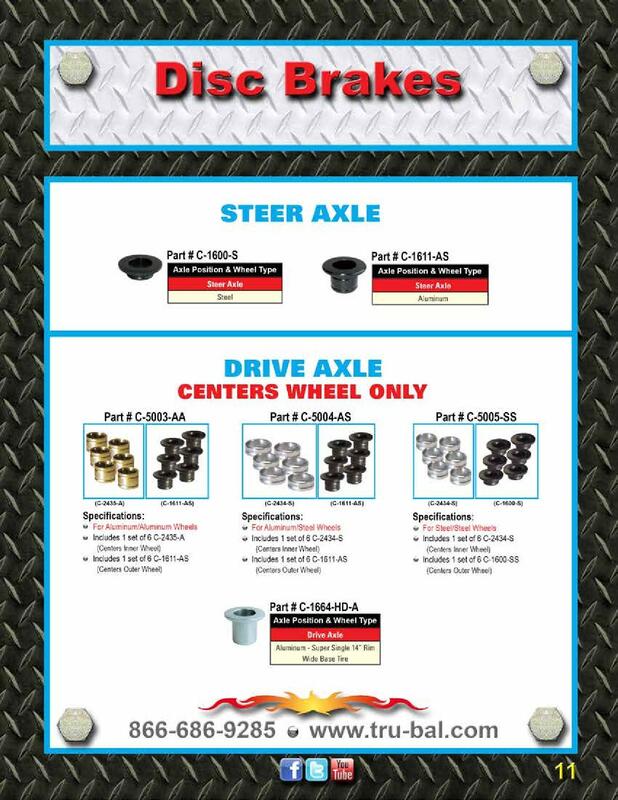 When I first heard about the product I was very skeptical but I decided to try it on 2 of my trucks I was having vibration problems with. I had replaced tires and front end parts but nothing had worked. I had drivers that were so frustrated they were ready to quit. One was ready to file a workman's comp claim because the constant vibration was causing pain in her elbows and wrists. Figuring I had nothing to lose, I had the wheels remounted using the centering pins and dispatched the 2 trucks on loads to El Paso. Within a few hours they called to say the vibration problem was gone. One of the drivers said it was like the truck was riding on air. I can't say enough about the products. They really do work. We use the centering pins along with the sleeves that stay on the truck so we always stay centered, even if we are far from the shop. It really did what it said it was going to do. I started with the centering pins but have the sleeves on the truck now too. They both do the job but the sleeves keep the wheels in place even over bad roads. 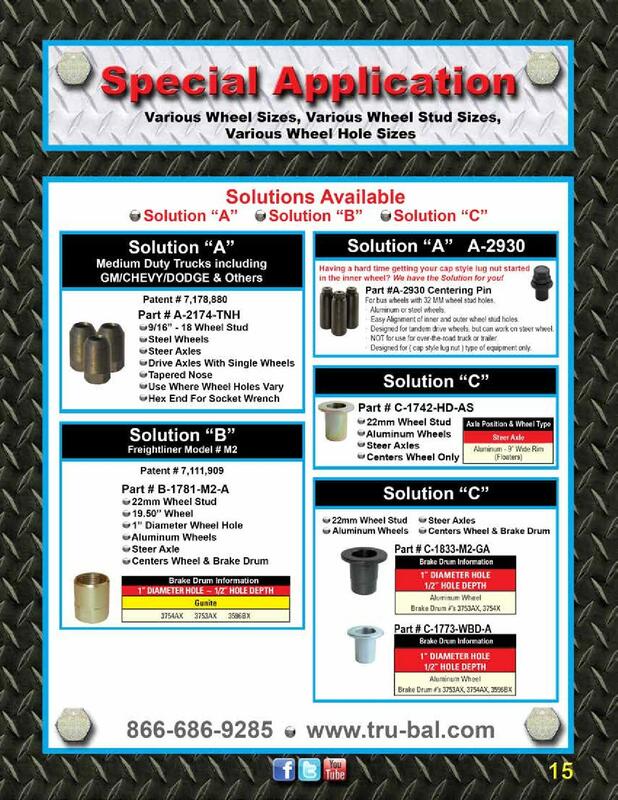 Anyone having vibration problems should give this product a try. I couldn't believe how well it works. I saw the ad for TRU-BALANCE and decided to try it because the idea of the product made sense. TRU-BALANCE took the vibration out of the truck and gave me a much smoother ride. I told my son about the product and he didn't believe it would work. He tried the product and his vibration and shake was gone too. I have a friend that is a tire guy. He had a problem truck that they couldn't fix. He had balanced the tires four different times and the truck still hopped like a rabbit. He used the TRU- BALANCE products and the hop was gone. I don't promote too many products but I promote this one. THIS PRODUCT WORKS!!!! I just can't say enough about this product. Tru-Balance has doubled our tire life. 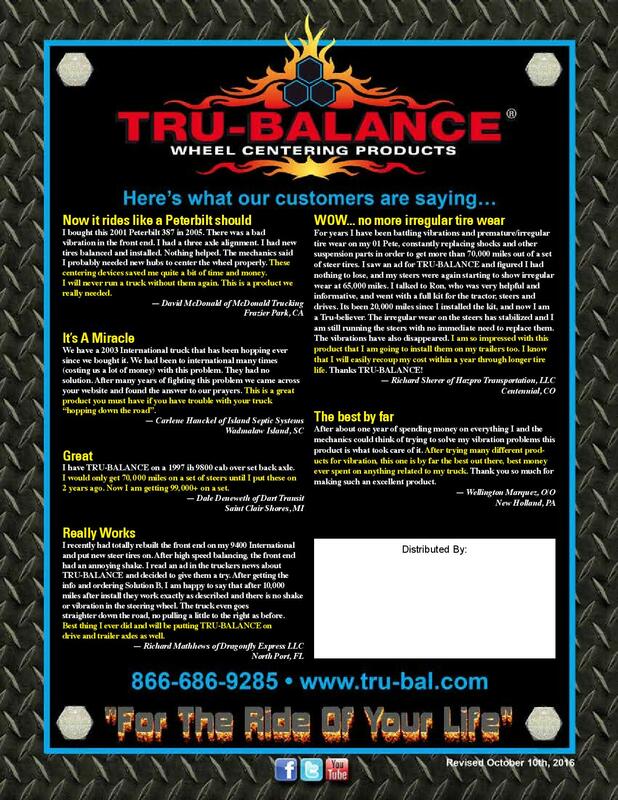 Tru-Balance has not only decreased the vibration problem we were having, but in most cases it has doubled our tire life. Our drivers are happy as they have a much smoother ride. The costs of tire replacement and maintenence is at an all time low, something we never thought we would see. 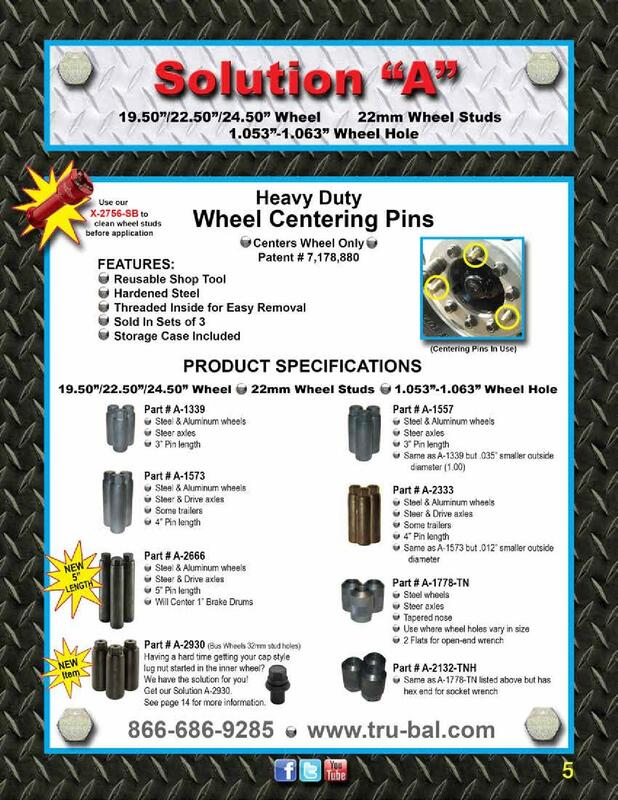 We use the pin tool to center all of our wheels and the sleeve sets to maintain the wheels once centered. This product has made a huge difference in our business. We wouldn't run a truck without Tru-Balance. 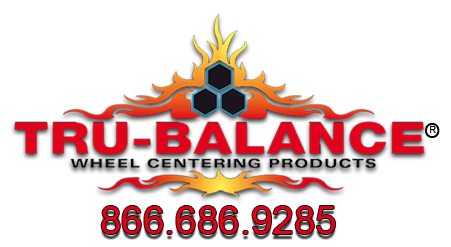 When I came across the Tru-Balance products in early 2005 I was skeptical. I decided to try the centering pins on a few of the major fleets I was having vibration problems with. 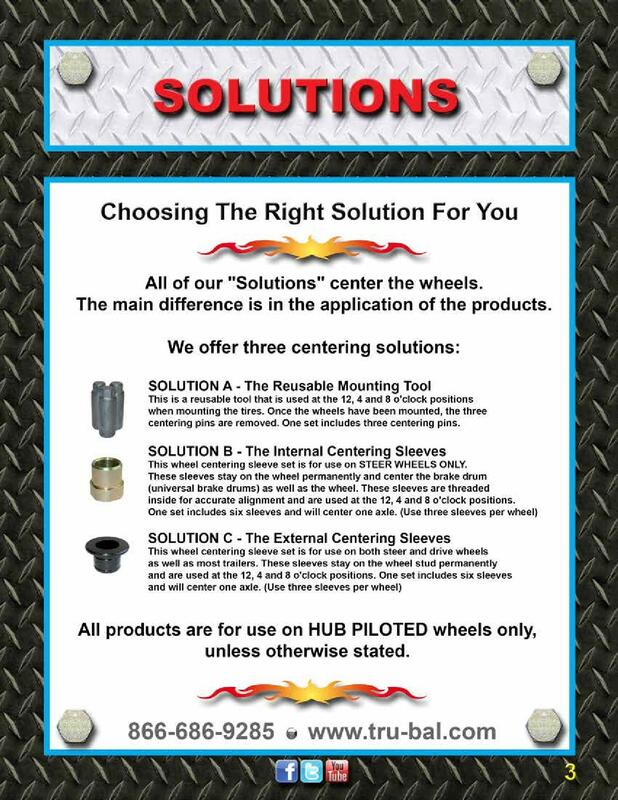 This product has solved my vibration problems. 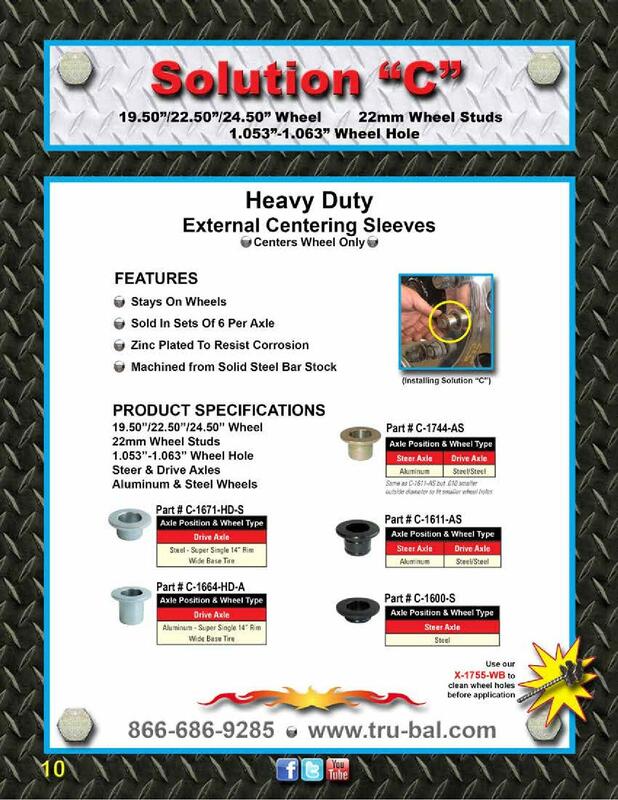 I have since purchased 175 sets of pins for our 24-hour road service trucks and by September 2005, all of our 57 commercial stores will use the Tru-Balance products when installing steer axle hub piloted wheels.